Heat oven to 375°F. Spray bottom only of 13x9-inch pan with cooking spray. 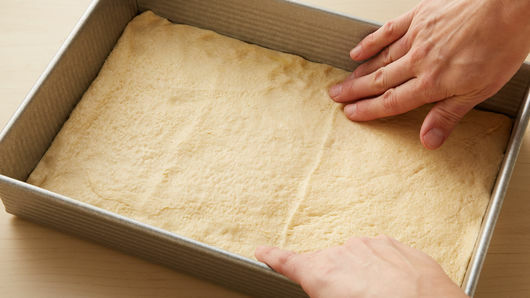 Unroll dough sheet, and press in bottom of pan. Bake 11 to 13 minutes or until light golden brown and baked through. Remove from oven to cooling rack; cool 10 minutes. Reduce oven temperature to 325°F. In medium bowl, beat cream cheese and granulated sugar with electric mixer on medium speed until smooth, scraping down side of bowl frequently. Add eggs, 1 at a time, beating until just blended. Add 1/3 cup of the reserved pineapple juice to cream cheese mixture; beat until mixed well. Finely chop 1/2 cup of the pineapple tidbits, and stir into cream cheese mixture. Cover and refrigerate any remaining pineapple tidbits for serving. Spread filling evenly over baked crust. Bake 25 to 30 minutes or until filling is set; cool 30 minutes on cooling rack. Refrigerate about 1 hour or until cooled completely. When bars are almost completely cooled, in 1 1/2-quart saucepan, melt butter over medium heat. Add brown sugar; cook 4 to 6 minutes, stirring frequently, until sugar dissolves. Reduce heat to low; carefully stir in whipping cream and vanilla. Return heat to medium, and heat to simmering. Cook 1 to 3 minutes, stirring constantly, until mixture is thickened. Cool 30 minutes before serving. To serve, cut bars into 6 rows by 4 rows. 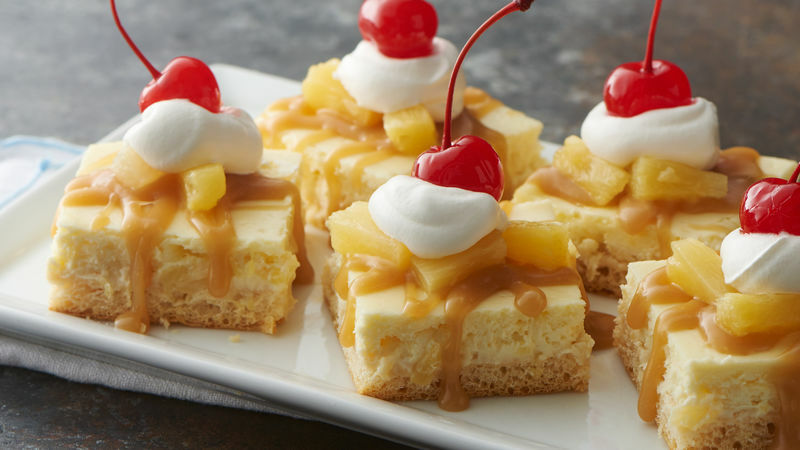 Drizzle cooled brown sugar glaze on top of cheesecake bars, and top with remaining pineapple tidbits. Garnish with whipped topping and maraschino cherry. Short on time? 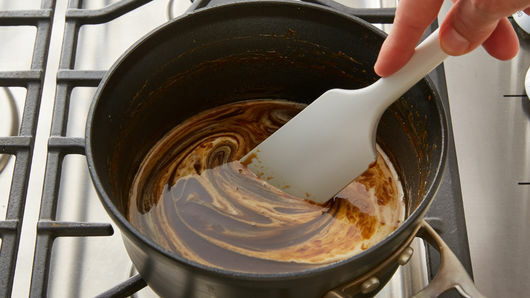 Substitute caramel topping for the brown sugar glaze. Brown sugar glaze thickens as it cools. 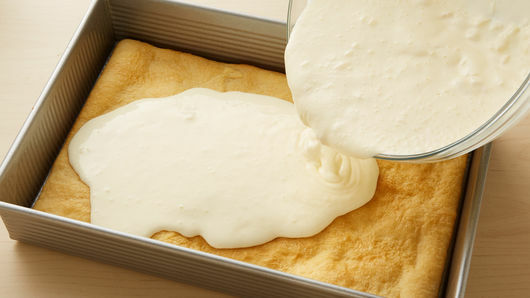 If necessary, stir in teaspoons of whipping cream to reach your desired consistency for drizzling. Store leftover bars and brown sugar glaze covered in refrigerator. To reheat sauce, microwave in glass 1-cup measuring cup uncovered on High 20 to 30 seconds, and stir until it reaches a smooth drizzling consistency.